Graco’s Ready2grow Click Connect LX Stroller is built to make getting out and about with two little ones in tow extra-easy. 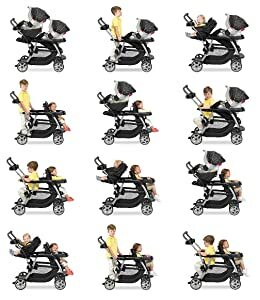 It accepts two Graco SnugRide Click Connect Infant Car Seats, so it’s like having two baby strollers in one. This double stroller is designed to help give your little ones a smooth ride. It features two lockable front-swivel wheels with suspension, to give you superior maneuverability so that you can make turns with ease. The Ready2Grow Stroller features the Face Time rear seat, so that you can enjoy more interaction with your child while you’re strolling. In addition, the rear seat removes, giving you easy access to the bench seat and a standing platform. This smart double stroller is designed to be comfortable for your children. It features a multi-position, reclining front seat that reclines flat for your child’s comfort. It makes it simple to adjust and find the most comfortable position for your child. After all, comfy strolling passengers are happy passengers! When you’re out and about with not one, but two, little ones, convenience counts. 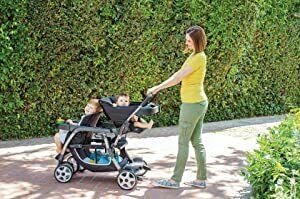 That’s why Graco built this double stroller to have an easy, one-hand fold, so that busy moms and dads can fold the stroller without having to bend over. Once it’s folded, the stroller is self-standing and has a convenient storage latch. If you have two children, you’re sure to use this double stroller for years. The front seat, bench seat and the standing platform each hold child up to 50 lbs. In addition, the rear seat holds a child up to 40 lbs. The Ready2Grow has great longevity, which is a really important feature among baby strollers. 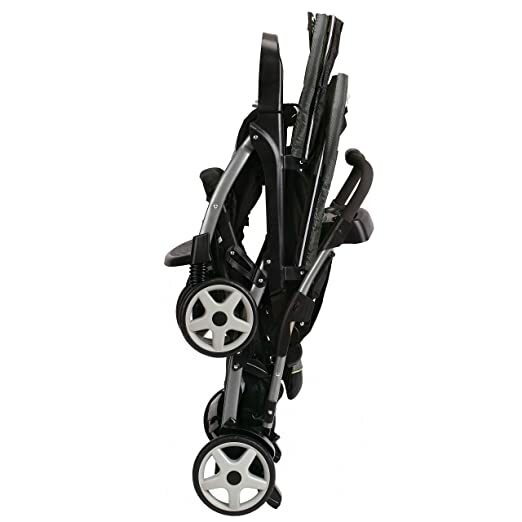 The Ready2grow Click Connect LX Stroller features an extra-large storage basket that holds the essentials you need to get out and about with two children (diaper bags, snacks, small toys). In addition, the toddler bench seat lifts up, so that you can access the storage basket with ease.